The Japanese Spider-Man series. First to use a gaint robot to defeat the monster, which became the basic format for super sentai. Well, different cultures have different standards for what is understandable. I mean, just look at what happened to "Spider-Man" when he finally made his localized debut in the country of India! Let me just tell you, the Spider-Man of India is a far cry from the Peter Parker Spider-Man known in the states! The writers actually wanted this to be faithful to the comics, but Bandai told them to add a gaint robot, since it was a craze back then. So the writers had to rewrite his origin. Despite that, Stan Lee LOVED IT. When did Spidey get a MegaZord? 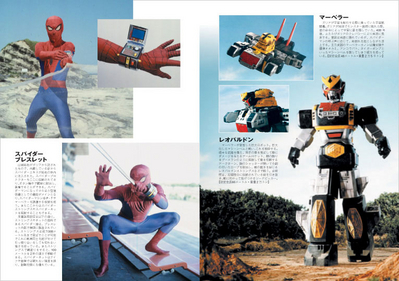 Spider-man was the FIRST to actually have a gaint zord. They never used them in live action before, so if this wasn't made, Sentai wouldn't have zords today, cause this proved it could be possible. Aaron Hong, do you know that every time I see a comment like the one you've just made above me, it makes me feel very sad for the millions of brain cells you must have had to sacrifice in order to post that comment? I weep for you, I TRULY do! Just proves I have enough cells left over to post this comment. Only reason I can do this now is because it's Good Friday and I have some time, but Colin's here everyday - so why are you making a ruckus only now? You made a post like that one and yet you insult me? XDXDXD. You phail! Yes, it's nothing compared to all the spamming you've done, is it? I'm free to post as much or as little as I want - but you can't help but post spam whenever you can. That's how abnormal you are. Obviously you'd see everyone else's comments as spam if you can't see your own spam as such. Thanks for reminding us of that. Imitating Famous Movie Announcer Don LaFontaine: "In a world where two bitter rivals try to sling mud at each other, what neither of them realize is that by trying to get back at each other, they are only setting it up so that in the end, both of them will lose for both not having the sense to leave stubborn people alone & find something else better to do with their time! 'Pointless Mudslinging the Movie!' Coming soon to a theater near you!" And by the way, I was being sarcastic! And what have you done? Post comments about George W and any little thing that comes into your mind with utter disregard for relevance? You may not notice it but you're the one who's the near copy of 'Rider Leangle', not me.